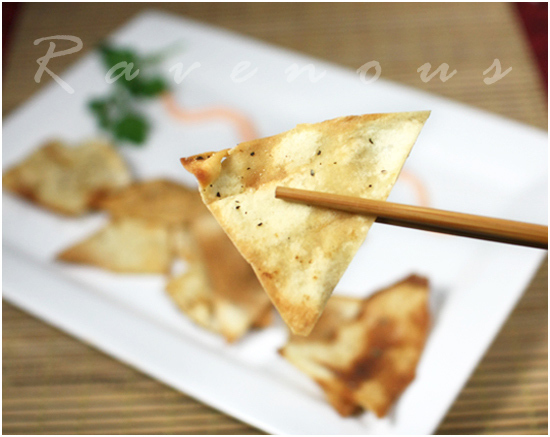 Home made pita / lavash chips are so easy to make and healthy snacks too. They’re also much cheaper than store bought chips which can be quite costly, especially the gourmet varieties. While store bought pita chips are good, my major complaint is that they’re often too thick. Luckily whole bags of pita breads are much cheaper and recently we had a ton of left over pita bread from a work conference and so I took some to make home made pita chips my way. 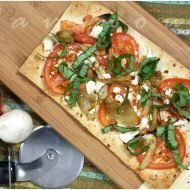 I love mine thin, crispy, and flavorful–and this recipe fits the bill perfectly! 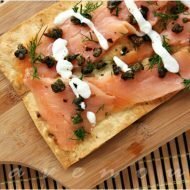 If you can get your hands on lavash bread, even better as these are much thinner than pita. Pre heat oven to 400 degrees. In a bowl, combine the olive oil along with the Montreal steak seasoning, herb de provence, and cracked peppers. On a large working surface, cut the pita pocket with scissors in half and carefully split open each pocket so that you end up with four pieces of pita. Now brush on the olive oil mix on both sides of each piece and then cut pita in triangular shapes. Place in large baking sheet or aluminum pan and bake for about 4 minutes or so until the top side gets lightly browned–then flip the chips and continue to bake for another 4 minutes or so until lighly brown. You may have to use multiple baking sheets or do this in batches. If you’re working with lavash, it’s much easier as it comes in a flat roll. Brush on your olive oil mixture and using a knife, cut out triangular pieces. Drain baked chips on paper towels and adjust final seasoning with fresh cracked sea salt. Cooks note: If you prefer the thicker chip, just brush the whole uncut pita and then cut into triangles. Feel free to experiment with different herbs and seasonings! 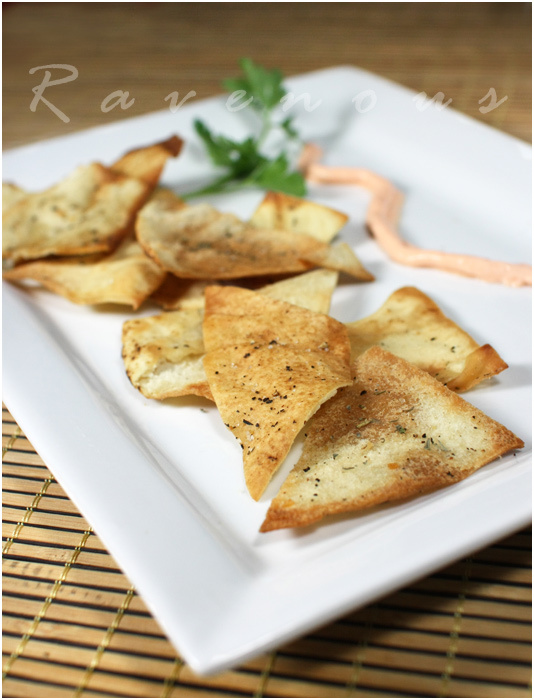 Thin, crispy, and flavorful pita / lavash chips are perfect for dipping or snacking by itself. The home made pita / lavash chips can stay fresh and crispy for days, but mine didn’t last long as my coworkers ate it all up! Oh, we don’t normally eat these chips with chopsticks…Kim wasn’t around to pose with her pretty manicured fingers and mine aren’t as nice–trust me, a hand model I am not. you're right, pita chips out there are thick while this one looks thin and crisp… great idea to make your own pita chips… plus you could play around with the spices that you could add on to it..
Nicely done!! All that's missing is s nice bowl of hummas. Mmmmm I like that you made then thin too. As much as I love pita chips, I too find them a little thick at times. Taking home pita bread from a work conference? That, my friend, is ghetto fabulous. Homemade pita chips? Now, that's just straight up fabulous. What a lovely reminder of these snacks, and what particularly beautiful photoes! Wow they look paper thin and crisp – just perfect! Great idea!! Oh, with or without Kim's pretty nails, the chips look amazing! Yum, I do this too, when I think of it! You can really play around with the spices, or make them plain. I've even made them sweet, with cinnamon and other spices. Thanks Hong and Kim for your great restaurant tips. I've linked your site to the post I just put up about my "tour" of Little Saigon restaurants. Hong, let's see those doctor hands! haha. I eat more than I should with chopsticks, but maybe not chips. malou: thin, crispy and healthy. perfect. Jenn: yeah we didn't have good hummus on hand so just snacked by itself. Gastronomer: You know it! Took home the bread too for that bread pudding. But I bring it back to work..consider it recycling. Ju and Jessica: Thanks, but also you know how the photo sites don't like hands in photos. You guys do it all!!! I've never made pita chips. I should definitely try this! I like the seasonings you added! Looks great! I tend to avoid buying pita chips as they ARE always too thick and often way too oily. These look PERFECT! Nicely done. OMG, so glad you dropped a comment on my blog…I am PSYCHED to find your gem of a blog!!!! Can't wait to try some of these recipes! Your photography is incredible too. herbes de provence… is that the free bottle we got from the fundraising event? that's great that you already put it to good use! i can hear the crunch of those pita chips already. mmm! yet another "why didn't I think of that?" recipe! Nice! Love love your new profile photo! Fabulous! And the recipe is so healthy and yummy! Trying to eat more sensibly after the New Year? Krissy: Actually we had an open bottle of the same brand so we used that. Bianca: we're not the first, and even Stacy's brand i believe started out making home made chips from her oven. Anh: Thanks! Glad you noticed.. Simple but FANTASTIC idea for my leftover pita bread. We use pita a lot and I don't know how I never thought of this before. Great idea. I have never thought of making pita chips at home because they are easily available. You might have just inspired me to do so. They look so good! Thanks for sharing the recipe. Homemade pita chips sound great! I love the picture with the chopsticks! Yeah, I agree. The store bought kinds are usually too thick and too salty. Yours look so thin that they almost look like tortilla chips! I like how you incorporated Herb de Provence, that's a wonderful idea! We always make homemade pita chips too, except I use Pam spray and Mrs. Dash seasoning. Fast and easy! Nice! I love making these at home too! I like the creative use of spices! This looks easy to make, I think I should try it! BTW, the chopstick was a nice FOBBY touch. I'm sure you got these female blog readers that don't mind you pulling a hand modeling duties! Em: it's quick and you can season with anything you like..easy peasy! Ninette: using the pam spray is a great idea!! KFP: gotta keep it FOBBY and back to our roots.. I made these last night with whole wheat lavash. I had to tweak the seasoning a bit because I had most but not all of the ingredients for the Montreal Steak Seasoning and Herbes de Provence, but they were still amazing — both by themselves and with hummus. Thanks so much for this wonderful recipe! Just made these with pinwheel lavash flatouts. 4 batches. diff flavors. 2 breads with Evoo, dried rosemary, seasoning salt, pepper. 2 breads with Ol Oil Pam, salt, pepper, garlic powder. cut about the size of a saltine. 9 gr protein, low fat. Deelish! !